Solinst AquaVent and LevelVent dataloggers use hydrophobic filters, taking advantage of their unique properties to improve vented water level datalogger instrumentation performance. 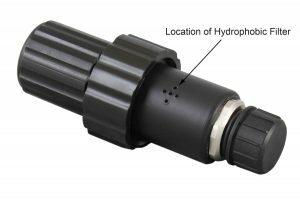 Vented water level dataloggers use a pressure transducer with a vent tube running from the sensor to surface. 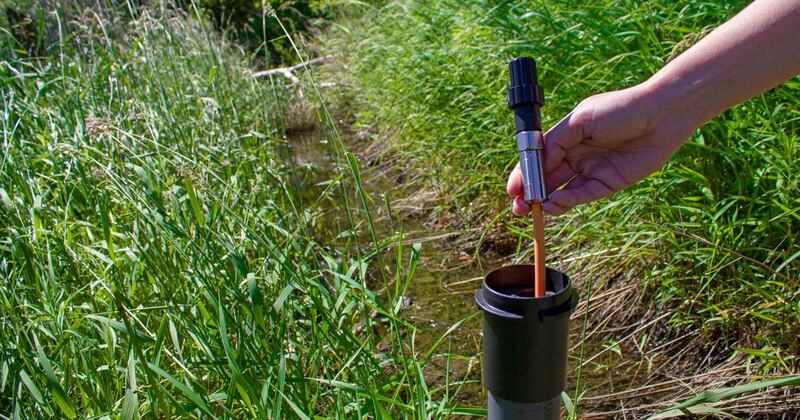 This tube provides an automatic cancellation effect for barometric pressure, producing instant water level data. Inaccurate water level readings can result from dampness in the vent tube. Traditional vented water level datalogger systems include desiccant capsules that are used to help keep the vent tube dry. Typically, desiccants need to be changed frequently, which can lead to many trips to the field for monitoring and maintenance. Solinst designs dataloggers to be as low maintenance as possible. When developing the LevelVent and AquaVent dataloggers, permanent hydrophobic filters were selected as an alternative to consumable desiccants. Hydrophobic filters are designed to provide moisture protection for the lifetime of the instrument—no replacements required. Hydrophobic filters are located inside the LevelVent and AquaVent Wellheads where they are vented to the atmosphere. 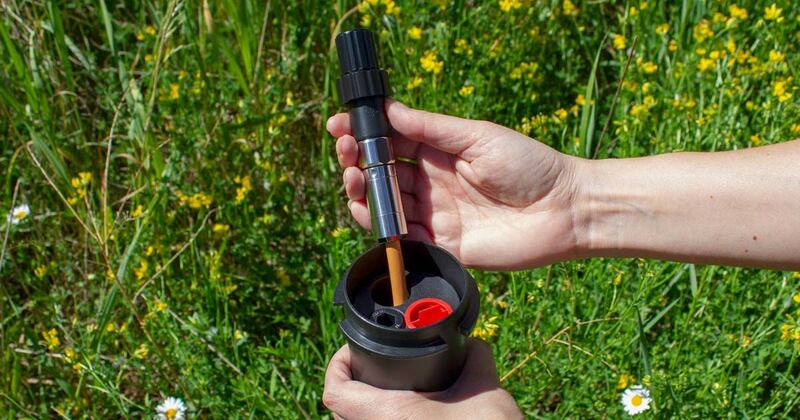 Hydrophobic filters are also located in the LevelVent and AquaVent loggers where the Vented Cable connects. The hydrophobic filters used in the LevelVent and AquaVent systems are expanded polytetrafluoroethylene (ePTFE) membranes. ePTFE membranes have pores that are greater in size than air, but much smaller than a drop of water. As such, they are naturally hydrophobic and repel water. Along with moisture, they ensure no contaminants such as salts or dirt enter the instruments. While the ePTFE membranes provide a moisture and contaminant barrier, they do allow air to flow freely in both directions, at a rapid rate. As air pressure changes, the fluctuations are transmitted through to the vent tube down to the sensor. This results in the cancellation effect of barometric pressure on the transducer. This high rate of airflow also enables short response times, preventing inaccuracy and delays in measurement results. Continuous equalization of pressure and temperature also eliminates any vacuum effect, which could pull moisture into the instrument. There may be concerns when using a vented water level datalogger in prolonged hot, humid conditions, as traditional vented systems require on-going maintenance to ensure the vent tube remains dry. However, ePTFE membranes in the Solinst vented systems have been tested in-depth under a number of different environmental conditions, including high heat and humidity. The membranes passed humidity testing for vent durability using industry recognized methods. Testing was conducted at 85ºC and 85% relative humidity for 1000 hours. Although the hydrophobic filters will prevent water intrusion even at one to two feet of submergence, care must still be taken to keep the vent locations on AquaVent and LevelVent Wellheads from being submerged. Both wellheads are rated IP 64, meaning they are dust and splash proof only. In addition to the hydrophobic filters, for permanent moisture protection, the LevelVent and AquaVent Wellheads and loggers contain multiple built-in desiccants where the Vented Cable terminates. There is no need to replace the desiccants, as they are also designed to provide permanent protection, while still allowing air to vent to the transducer. The Vented Cable connects to the LevelVent and AquaVent Wellheads and loggers using stainless steel twist connections. These connections are secure and provide a seal from moisture by use of o-rings. Before the Vented Cables are shipped, the vent tubes are blown dry with nitrogen gas, and capped. This ensures the vent tubes are dry when the product is received. If moisture does enter the vent tube, Solinst offers a special blowout fitting that allows nitrogen gas to be blown through the vent tube. This ensures any moisture is removed, before deployment or before storage. This entry was posted in Water Level Datalogging and tagged vented pressure, water level dataloggers, vented pressure transducer, 3500 aquavent, 3250 levelvent, vent tube, hydrophobic filters on October 10, 2018 by Tricia Lane.